Did you know that AlterCam is now able to record your streaming webcasts? 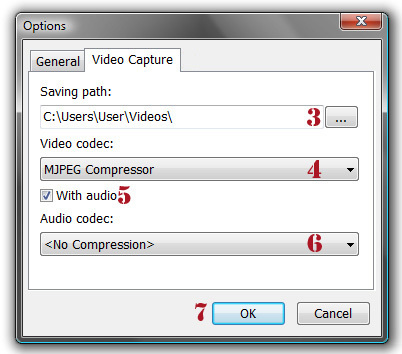 Our Capture option lets you select your audio/video codec and saves your streams as videos! Whether you want to record a conversation with a friend, an important business meeting, or you're looking to build a multimedia presentation AlterCam is here to help. To learn more about how to get started using this feature, check out our How-to guide located below. First, tell AlterCam where to save the video after it's created by clicking the [...] button next to the Saving path field. (If no path is specified, the video will be saved in the download folder by default). The next step involves choosing a Video codec (format) to save the video as. Clicking the down arrow will reveal several popular video codec. If you want AlterCam to add sound to the video, make sure that the With audio box is checked. If you decide to include sound, clicking the down arrow on the Audio codec bar will open a menu that offers many codecs to choose from. Once all of the settings have been determined, click OK to continue. From here, click Capture. AlterCam will record everything that is streaming until the Capture (Stop) is clicked again. This will tell AlterCam to stop recording. The video will automatically be saved to the destination defined in step (3). If you need to edit your video - add some text, cut, or resize, you can do this with our Bolide Movie Creator video editing software. Follow the link to download the program.